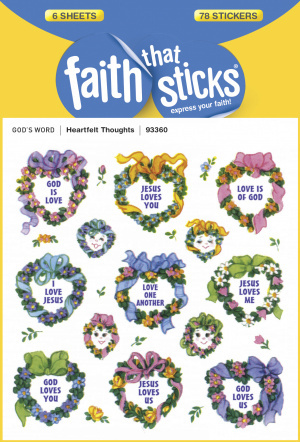 Heartfelt thoughts are at the center of these wreath-shaped stickers decorated with colorful ribbons and blooms. Nine different designs (approx. 1" x 1") proclaim I love Jesus, God loves you, God is love, and more. Four smaller wreaths featuring playful faces are sure to evoke a smile. Six sheets, 13 stickers per sheet; 78 stickers per package. Heartfelt Thoughts by Faith That Sticks was published by Faith that Sticks in February 2014. The ISBN for Heartfelt Thoughts is 9781414393360. Be the first to review Heartfelt Thoughts! Got a question? No problem! Just click here to ask us about Heartfelt Thoughts.